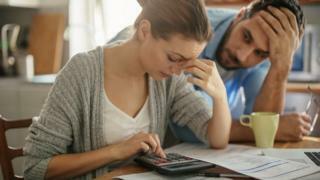 People with problem debt could be given a six-week breathing space, the government has confirmed. It follows pressure from rebels in the House of Lords, who had threatened to vote down the Financial Guidance and Claims Bill later on Tuesday. They wanted the bill amended to include the breathing space idea. But the Treasury has now confirmed that help for those in debt will now be the subject of a consultation, and will become law by 2019. The plan will apply to England, Wales and Northern Ireland, as Scotland already has a similar scheme in place. The concept had been promised in the Conservative party manifesto, and was mentioned in the Queen's Speech. The news was welcomed by the debt charity StepChange, although it said debtors needed protection beyond the six week grace period. What is debt and when should you worry? However, the rebels - led by former pensions minister Ros Altmann - still want a ban on pensions cold-calling to be included in the bill. The Department for Work and Pensions announced in August that a ban would happen, but as yet there is no date. It told the BBC that a bill would be brought forward "when time allows". Under the government plan, those people affected by debt would be exempted from further interest, charges and enforcement action in order to give them a chance to seek advice. That exemption period could last up to six weeks. The Economic Secretary to the Treasury, Stephen Barclay, said: "For many people in the UK problem debt seems impossible to escape. Its effects can be far-reaching, impacting all aspects of a person's life and leaving them feeling helpless. "That is why we are working to give people who are overwhelmed by debt, more time to seek advice, find a workable solution, and help get their lives back on track." The plans include better legal protection for debtors once a debt repayment plan is in place. But the debt charity StepChange said there needed to be protection from creditors right the way through the process. "We know from the experiences of our clients that continuous protection between the initial breathing space period and any statutory repayment plan is vital," said Mike O'Connor, the chief executive of StepChange. "Any interruption would destabilise fragile family finances and risk putting people back to square one." Citizens Advice welcomed the announcement, but said the regulator needed to do more to stop people getting into problem debt in the first place. The Conservative rebels will still push for an amendment to the Financial Guidance Bill to include a ban on pension companies cold-calling consumers. It is illegal to cold-call someone to try to sell a mortgage, but as yet not a pension. Many people have been scammed, after being persuaded to withdraw cash from their pension and move it to unregulated investments, such as storage schemes or car-parking spaces. "The government has talked about banning cold-calling - it's talked about protecting pensioners - but in fact it hasn't done anything yet," said Ros Altmann. "This bill is an ideal opportunity to actually put some legislation in place that would ban cold calls."